Stone has seen an architectural resurgence and has quickly become one of the most requested and accepted building products in today’s construction industry. The natural earth tones, colors and textures that stone can provide create new dimensions and visual appeal to any project. Stone can give your project an instant impression of stability and strength in the marketplace. There are three types of stone that are most commonly used in the commercial construction industry today. The most common type is full bed depth architectural masonry and cast stone, which itself is produced in three different processes. The second type of stone is manufactured thin stone which varies in size from 5/8” to 3 5/8” bed depth. The third type is natural thin stone quarried and cut to size. Please contact Mack Brick to help with questions architectural stone detailing or design assistance. Three process of producing architectural stone include machine made, hand tamped and wet cast. These processes always use the exact same mix design consisting of crushed limestone, silicate sand and portland cement. After each piece is moulded they are kiln dried giving them the strength and durability of natural stone. Integrated water repellent is added to the mix and included in every piece of stone produced giving the designer the ability to use the product at or below grade. Flexibility with moulds allows the designer and mason to use longer sized units and also have returns built into the mould, reducing labor and saw cutting material on the jobsite. Machine made architectural stone veneer is precision produced in mass quantities using pressure and vibration to ASTM C-90 specifications. Automated color batching insures color constancy throughout every unit that is produced. Machine made units are available in a variety sizes and textures, with eighteen monotone and ten blended colors. Producing architectural stone veneer by machine, makes stone very economical to use on your project. Hand tamped units, or cast stone as it is better known, start with a cabinet quality wooden mould. The mould is loaded with dry stone mix and pneumatically tamped by hand creating one piece in about twenty minutes, allowing multiple pieces to be produce from the same mould per day. These non structural units are precision tooled and meet ASTM C-1364 specifications. There are many applications in which hand tamped units can be used, such as decorative bands, water tables, copings, sills, arches, and surrounds. You may use our ready shape catalog or create your own unique profile to add another dimension to your project. Hand tamped units are available in the exact same monotone and blended colors as our machine made units and allow you to mix both types of stone; machine made and hand tamped on the same project with no color variation. Wet cast units start with same type of mould as the dry tamp, however the difference being is the moisture content of the mix. Wet cast mix is the consistency of applesauce when added to the mould and then allowed to dry completely in the mould creating one piece per mould per day. The process of wet cast has the ability to encapsulate steel or rebar to produce structural load bearing pieces for your project. 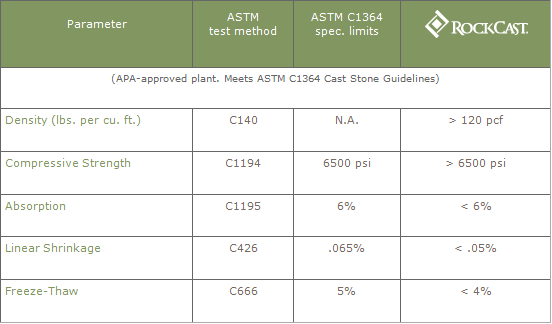 Wet cast units are always produced to meet ASTM C-1364 specifications and can be used for all of the same applications as hand tamped where a structural piece is needed. Please see our ready shape catalog or create your own unique profile for your project. Wet cast is available in the same eighteen monotone colors, however cannot be produced in blended colors.